Peace claimed its victims. The victims were young, daring fighter pilots. They were demobilised, knocked out of ac­tion. But the knocks did not leave them down and out. Many of them found new areas of activities. John Alcock and Arthur Witten-Brown had served the Royal Air Force as fighter pilots (Fig. 5.1). They did not like being grounded. How could they get a chance, once again, to fly? Alcock heard, while spending an evening at the club, in late 1918, with a friend, of a prize of 10,000 pounds of­fered by the Daily Mail to the first person to fly non-stop across the Atlantic. "This is one flight I can undertake. If only I can find a sponsor, who gets me an aircraft and also provides funds to equip it…" Alcock didn’t complete the sentence. "That shouldn’t be a prob­lem", the friend mumbled. "So, where do you see a problem?" Alcock said edgily. "It’s a mission fraught with danger", the friend warned. "That’s the least of my Fig – 5.1: John Alcock and worry", Alcock Smiled wryly. Arthur Witten-Brown. "I’ll make a bid, if I get necessary backing", Alcock replied. He discussed the matter with Arthur Witten-Brown, a former RAF fighter pilot, and asked, "If I ask you to fly with me?" "I’ll jump at the offer", Brown responded with joy. "That’s a deal", Alcock reached out for Brown’s hand. A checklist of possible patrons was prepared. This list helped them find support for their project. Which aircraft should they fly? They remembered the Vickers Vimy biplane, which they had flown during the war on bombing missions. It was a large plane, powered by two Rolls-Royce engines. It had speed and strength. "WeTl have to fly from the American end", pointed out Brown. "I know. Air currents make a flight, across the Atlantic, heading toward Europe, easier", Alcock smiled. The two got hold of a bomber, dismantled it and carted it, in sections, to St. John’s, New Foundland, and set up camp (Fig. 5.2). The site for assembling the aircraft lay at an open ground called Mundy’s Pond. The two secured assistance of a handful of enthusiastic mechanics and reassembled the aircraft. They attached additional fuel where the aircraft once ’ carried bombs. Some space for storage of fuel was provided in the wings too (Fig. 5.3). While these preparations were under way, the Ameri­can Navy launched a hopping flight across the Atlantic. Curtiss co-ordinated the technical details of the flight. Lt. Commander J. H. Towers led the group of four seaplanes. Seaplanes and flying boats take off and land on water. Due to lack of runways, normal airplanes could not operate as passenger carriers. The seaplanes and the flying boats, therefore, were used extensively to transport people around till about 1950. The seaplanes set out on 8 May 1919. One of the planes developed problems and dropped out. The others, after a few halts, reached Lisbon on 20 May. A week later, they flew to Plymouth, England. It was not a non-stop flight. So Alcock and Brown were not unduly upset. Cause for worry came from another source. At St John’s, two daring pilots, Harry G. Hawker and Mackenzie Grieve, were making the final preparations to fly a single-engine Sopwith biplane across the Atlantic. They set out on 18 May 1919. Alcock and Brown cursed their fate. Had they come so far, only to be beaten in the race by their competitors? That thought nagged them, while they waited for further reports of the flight of the Sopwith. 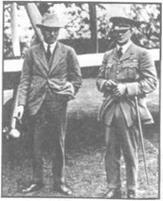 Harry G. Hawker and Mackenzie Grieve flew toward the Irish coast. The engine coughed and spluttered after covering about 1,800 km. The deep blue stretch of the sea menacingly closed in as the plane lost height and tumbled into the waters. A tramper rescued the bobbing men from the waters. Thus ended their bid for the prize. The news lifted the spirits of Alcock and Brown. They hurried with the final preparation. 14 June 1919 was a bright sunny day. Reports indicated that the weather would hold, for some time. Of course, no­body took such predictions seriously. The weather could turn bad, suddenly, without warning. The two pilots got into the cockpit. Alcock started the engine. He pulled the throttle. The aircraft raced along the bumpy, uneven field. The wings, laden with fuel, drooped. The aircraft lifted off, sluggishly, just a few feet before it reached the block of trees that cir­cled the field. The aircraft skimmed inches above the trees. For a couple of hours, the aircraft was nudged faster by the tailwind. That gave an added 64 kmph to the normal cruising speed of 145 kmph of the aircraft. The first setback for the fliers came when the radio conked off. Thus the plane’s communication line was snapped. Soon, the airplane began to rattle. A quick check by Alcock made him shiver. The exhaust of the right engine had cracked. It was quivering as if mad, while tongues of flame danced around the crack. For a moment, Alcock thought it marked the end of their mission. Then hope surged up. He told himself, "We’ve weathered many a storm, during the days in the RAF. So, even this threat may pass". It did pass. But soon the plane ran into massive air turbulence. Vertical air currents spun the plane, viciously. The plane lost height. It came as close as 20 m of the sea. Alcock pulled at the stick, frantically. The plane quivered. Then its nose rose and Alcock and Brown sighed in relief. The plane regained altitude. John Alcock steered the plane above the clouds and the fog. The plane faced a new danger. Sleet and snow hit the plane. The roar of the en­gines was loud. The two men could not even talk to each other, find out how they could face the threat. Brown acted on his own. He grabbed a knife and climbed out of the cockpit, crawled over the right wing, got close to the engine and scraped the blocks of ice that coated the engine (Fig. 5.4). Back he went to repeat the operation with the sec­ond engine. It was a very risky operation. A sudden gust of wind, a surge of air current would have sent Brown plum­meting into the icy waters, below. Alcock decided to fly at a lower altitude. The fog had cleared. For seven hours, the weather tested the limits of endurance of the pilots. awareness touched his lips with a thin smile. Alcock checked the maps, read the compass and made quick calculations. The plane was heading toward the small town of Clifden, some distance off Galway, the original tar­get the pilots had set. Alcock circled the land. Brown spotted a vast ‘open ground’. Alcock started the descent. The aircraft touched down, in the centre of a muddy patch. The wheels of the aircraft lay buried in mud. Quickly, the two men on board the aircraft got out, splashed their way through the mud and reached firm ground. "That’s it", Alcock hugged Brown. The two stood, with tears of joy streaking down their cheeks. It was their moment of triumph. They had crossed the At­lantic without a halt in between. This triumph made them heroes. Wherever they went, large crowd mobbed them. Young boys and girls crowded around them, seeking autographs. Cameras clicked, catch­ing their profiles on films for eternity. They received the prize money. That cheered them. But happier still were they when the King of England knighted them, at a special function at the Buckingham Palace. In 1914, the Archduke Ferdinand of Austria was assassi­nated. The tragedy rocked the whole of Europe. War clouds gathered. Efforts to avert a war failed. The Astro-Hungar – ian Empire, Germany and Turkey, formed a group. Pitted against them were the Allies, composed of Britain, France, Russia, Italy, Japan and the United States. First World War broke out. Nations at war have, since time immemorial, adopted many strategies to gain their ends. Among them, the effort to gather information about the enemy’s strength and for­mation remains vital. It was so during the First World War too. Field scouts fanned out, sneaked, as close as they could, to the enemy lines. They stayed beyond the firing range of the enemy, watched through telescopes and gathered infor­mation. Manual scouting almost ended when machine guns, invented by Fliram Maxim, came into use. The enemy de­fended his camps with machine guns. The scouts could not get close enough to gather information. enemy formations and camps while the aircraft flew at heights well beyond the range of guns on the ground. Aerial reconnaissance became the order of the day. How could enemy snooping be stopped? Instructions were issued to designers of aircraft to come up with ways and means to stop the predators. They considered various options and finally came up with a single-seater fighter air­craft, equipped with guns, to intercept and down enemy aircraft, engaged in aerial survey. This was just the beginning. Soon came a brilliant idea. Can’t single-seated aircraft fly over enemy territory and drop bombs? That marked the birth of bombers. New designs improved the speed and manoeuvra­bility and fighting power of the air­craft. rotating blades were not in the way of the gun. This device proved very effective. Roland Garros (Fig. 4.1), a French pi­lot, used this device to shoot down three enemy aircraft during one mission (Fig. 4.2). The Germans were not far behind. They developed the Fokker, a small aircraft (Fig. 4.3). Its top speed was 130 kmph. A fleet of 50 such aircraft went into action against the Al­lies. They turned out to be a real scourge. Aerial bombing caused severe damage to people and property. The English and the French reeled under the attack. and systematic. Pilots mastered the art of flying in forma­tion. This led to development of Squadrons with defined duties. Repair centres were also set up. Germany continued to make headway in exploiting the air power. Britain and France found the answer to the Fokker air­craft in new designs. In 1915, Capt. Geoffrey de Havilland produced the D4-2. It could fly at a speed of 140 kmph. The Fokker could not match it in speed and dexterity. The Germans, in turn, improved on the French aircraft Neuport and produced Albatros D-l (Fig. 4.4). It had dual machine guns, with double the fire power, mounted near the cockpit. The Albatros carried out attacks on Britain in April 1917. (Historians refer to the period as Bloody April). England lost 151 planes; Germany just 51. German bomb­ers, called Gothas, carried out aerial bombing even during the day. The Allies were unequal to this assault. The chances of holding back Germany looked bleak. with a maximum speed of 192 kmph at an altitude of 7,000 m.
Most of the aircraft had limitations. The Gothas were tail-heavy. So pilots had trouble keeping the aircraft steady at landing. The lower wing of the Albatros twisted easily while the aircraft dived. All aircraft shared one danger. Of­ten the fuel tank caught fire. Pilots didn’t have parachutes. So they could not bail out when their aircraft were hit. They faced a fiery end. Often they shot themselves before the fire got to them. The War proved the importance of air power in war. The men who headed Britain’s War Office realised this and held meetings to debate the issue. These deliberations led to the formation of the Royal Air Force on 1 April 1918. That marked the culmination of a small, hesitant start made in 1908. In the same year, on 16 October, the first British Army Plane, designed by Cody, flew a distance of 410 m. That was just a flash in the pan. After the flight, a cost study was undertaken. The project had cost over 2,500 pounds. That was considered too high. Further work on the aircraft was shelved and the factory shut down. However, within a year, Britain received a new jolt. Louis Bleriot flew across the English Channel. That flight was an eye-opener for the British. For centuries, the people had looked upon the English Channel as a God-given defence, a natural moat. It had warded off attacks by sea, on several occasions in the past. Bleriot’s crossing of the Channel marked the end of the Channel’s invincibility. The Channel could not provide any defence against air attack. Around this time came reports of progress by France and Germany in aviation. Bleriot, Deperdessin, Morane and Farman, four French companies, took the lead in the pro­duction of aircraft. Britain could buy French aircraft. But that would leave Britain dependent on the French. Self-reli­ance became the need of the hour. The old factory was re­started. Geoffrey de Havilland, who had the requisite expertise, joined the factory as designer and test pilot (Fig. 4.6). 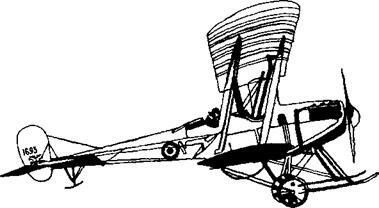 He de­veloped the two-seater biplane model B. E. 1. It was improved and developed as the B. E. 2 (Fig. 4.7). enemy submarines and ships, and carried out heavy bomb­ing of enemy installations and formations. led the nation to victory in the Second World War), who was the Secretary of State for both War and the Royal Air Force (RAF). He backed the RAF to the hilt, encouraged es­tablishment of schools to train pilots. Mock fights and air stunts won public backing to the Air Force. The pilots did not remain idle. The RAF saw action in campaigns against tribals in British colonies. It flew in to contain troubles in Iraq in 1922. In 1928, tribal groups of Afghanistan, led by Kabibullah Khan, rose in revolt. The men surrounded the British Legation at Kabul and took 586 people as captives. How could the captives be rescued? The terrain was mountainous, rugged, mostly snow-covered. Wild winds swirled around. The Royal Air Force was as­signed the task of airlifting the captives. The pilots rose to the occasion. The operation was truly hazardous. The weather was unpredictable. The terrain was hostile. Yet the pilots completed the rescue, despite ceaseless gunfire from the ground. Each successful operation gave a stimulus to research in aircraft design. Powerful engines and new designs en­hanced the speed and range of aircraft. The First World War had given a big boost to aviation.